We are offering Vigeowebsite special plans to freelancer, agencies and their clients. We offer you a service in which you can support yourself to offer a complete package to your clients. Vigeowebsite is the most innovative Service that completely transforms the concept of Website Builder. 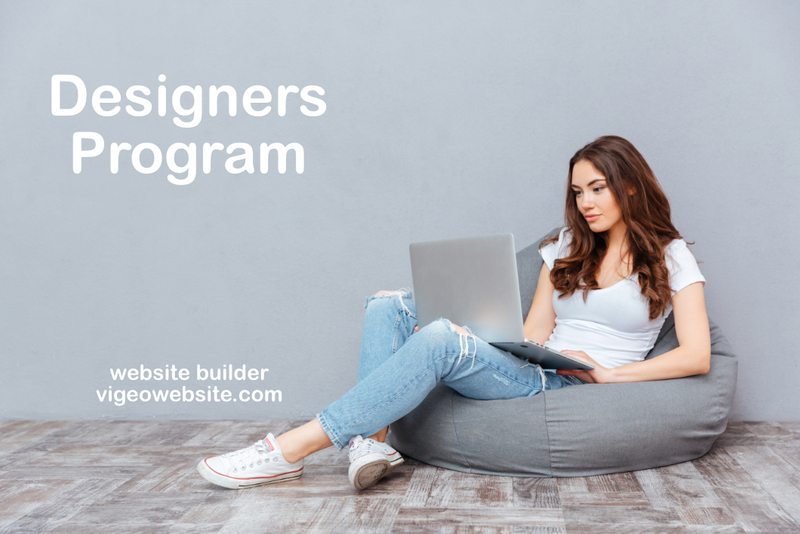 To Qualify for Designers Program you must be Freelancer or Agency, open a ticket to the Sales Department and Request to join the Designers Program (Ticket Subject). It's that easy to qualify! We send you an email with the Unlock Code, link for purchase and instructions necessary to be able to make your purchase of the Designer Plan that you want (for yourself or your customers). You can buy for yourself or your customers Vigeowebsite Plans with 35% less than regular price. No Branding/Linkback. Buy the plan you need, when you need it, you will always receive the discount! We offer you a service in which you can support yourself to offer a complete package to your clients using our entire platform and without you needing to take care of any technical aspect or any support. The Designers Agreement establishes the bases of the Designers Program (Freelancer and Agency) and you agree to be bound by this agreement if you decide to participate in the program. With each plan you purchase for your customers you get access to an independent Dashboard. All the plans you acquire for your customers can be managed from your Client Area with your Designer Account. Let us take care of all the technical aspects, while you as a designer produces striking images, you create great web themes and awesome icons, and you use our Dashboard to build your client's new website by bringing it to life with their creations.